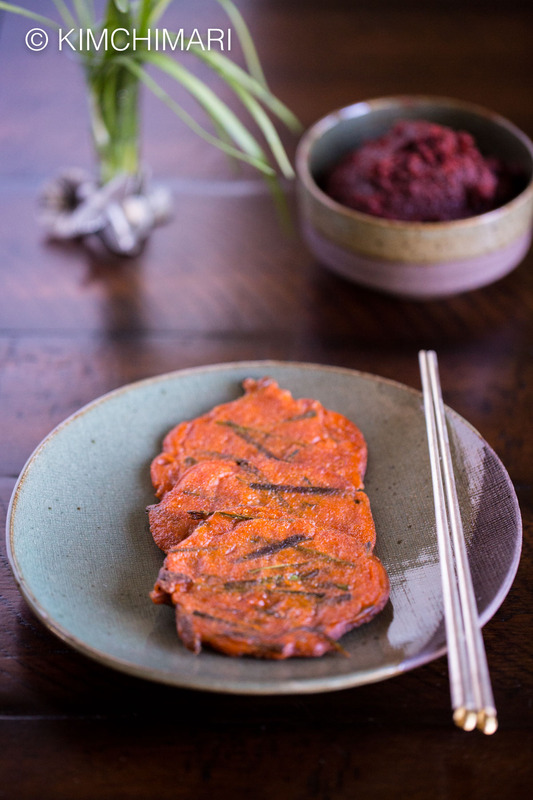 Gochujang Pancake (Jangtteok) is the best way to enjoy the wonderful flavor of Korean red chili paste. Gochujang seasons the pancake perfectly with no need for any dipping sauce. Ready in 15 minutes with just 5 ingredients. Gochujang pancake or Jangtteok is something that I had quite often at home when I was kid in Korea. Back then, I really didn’t think that it was anything special because we had it at home often. But once I left Korea, I found that not many Korean restaurants serve them and not even many Koreans make it at home. I bet most of you have never heard of this dish. If you have, or if your family makes them, I would LOVE to hear how you make yours! I kept most of my last year’s gochujang in my kimchi fridge so that they would ferment slowly and it has staying beautiful so far. And I take out a bottle at a time, leave it in my pantry and use them while it continues to ferment. Now because I still have so much gochujang, I wanted to make something where gochujang was really the star of the dish and then I remembered this one!! Jangtteok–which basically means fermented paste (jang)+ steamed cake(tteok)–is a dish that goes back in historical Korean recipe books as far back as 1766. This Korean gochujang pancake is made throughout different regions of Korea but best known one comes from Andong, Gyeongsangbukdo. 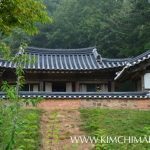 (BTW, read my Breakfast at Andong post to learn more about this beautiful area). This very traditional tteok was often packed as snacks on long trips in the very old days with no fast foods to hold you over. Jangtteok varies quite a bit regionally in terms of the ingredients and how it is cooked. Ingredients wise, Gochujang or Doenjang or even a combination of the two soybean pastes are used in 1:1 ratio since they are both jangs. 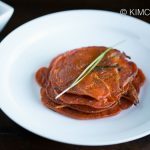 Gochujang Pancakes (or Doenjang Pancakes) are often made with any combination of chives, green chili peppers, zucchini, mountain greens (namul), tofu and even with ground pork or beef added – based on the region. The cooking method has also changed over time. Most current recipes make a simple flour batter and add gochujang to it but the more traditional old style recipe makes it into patties first, steams them and then pan-fries them. Sometimes they are dried after they are steamed. And because of this steaming step, it was called ‘tteok’ and not ‘jeon’. So maybe one could argue it should now be called jangjeon and not jangtteok since few people steam it anymore. Below is the more modern simplified recipe that is just a simple batter with chives added. Oh, by the way, it’s still quite early spring but my chives are coming back beautifully! 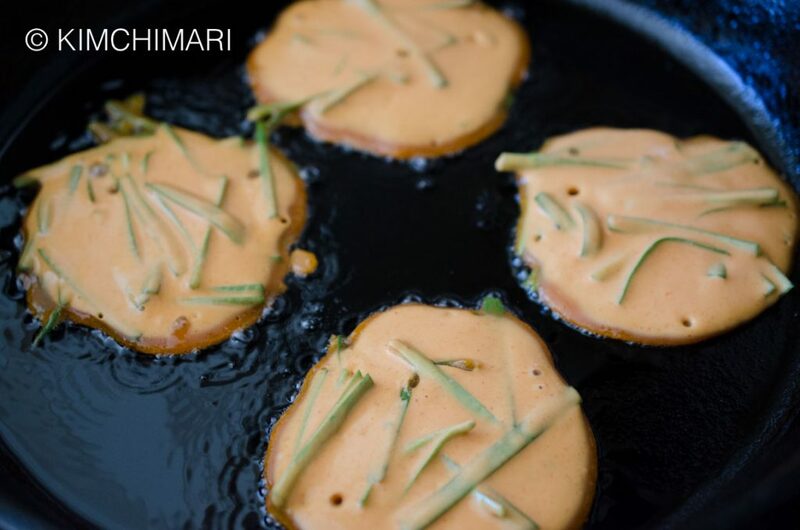 It’s not a whole lot of chives but certainly enough chives to make a batch of this gochujang chive pancake recipe. 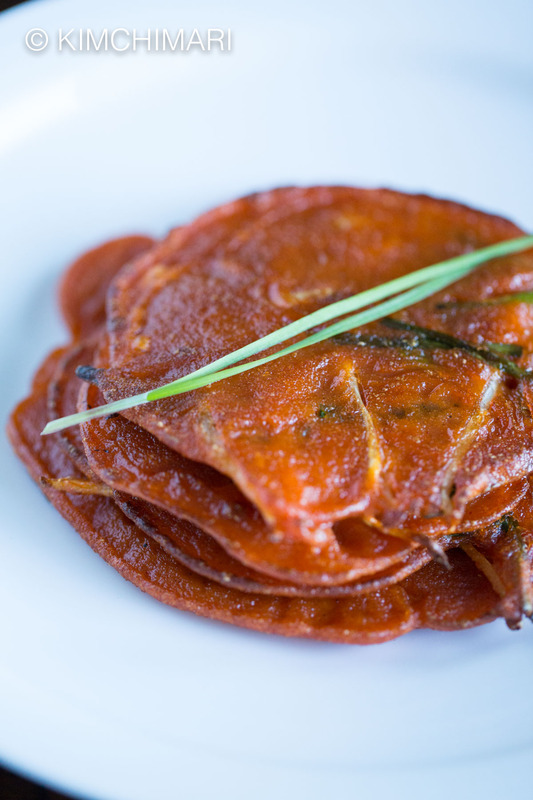 Now, similar to kimchi jeon or bindaetteok, jangtteok (gochujang pancake) pairs really well with makgeolli or soju. Another great dish that can be served as appetizer, as side dish (banchan), as snack or rainy day anju to makgeolli. Wash and rinse chives. 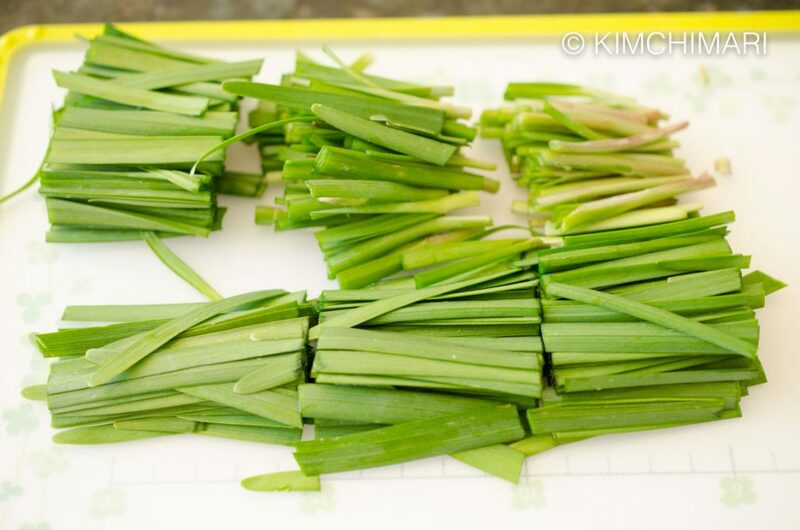 Cut chives into roughly 2 inch (5 cm) lengths. 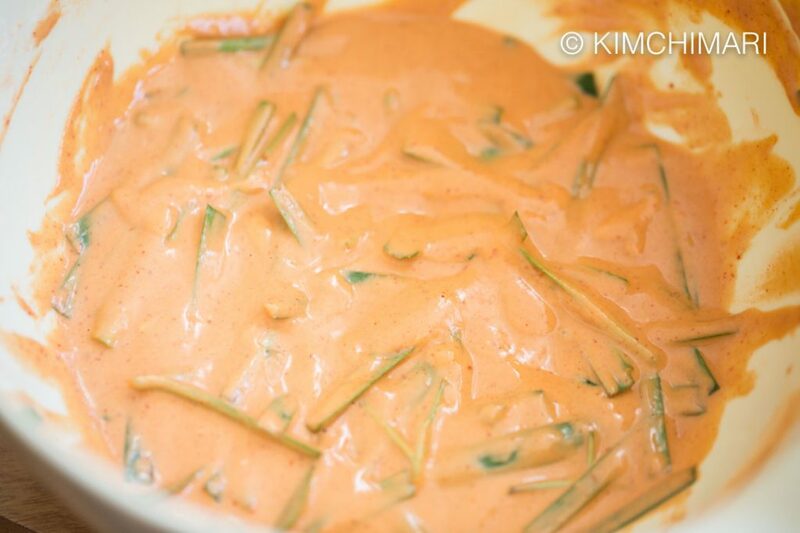 *Because gochujang is strong in flavor, the stronger flavored Chinese chives or Korean chives will work better. American chives may be too weak in flavor. Make batter by whisking flour, water and gochujang. Mix until there are no lumps. Batter will be thicker than your usual Korean savory pancake (jeon) consistency. Add chives to batter. Optionally, add julienned zucchini, green chili pepper slices and other vegetables. Just make sure you julienne them or slice thin. Heat good amount of oil (1~2 Tbs) in frying pan on medium high heat. Ladle the batter into the pan to make 3 inch pancakes. You can make one large one too but normally jangtteok is made in smaller sizes. Because the batter will be thick, make sure to spread it out a bit with a spoon or ladle so it doesn’t come out too thick. Fry gochujang pancake for 1~2 mins until the edges are cooked like above. Turn it over and cook another couple minutes until they are slightly browned. Serve warm or at room temperature (which is also yummy). No sauce needed but you could serve with some fresh garnish of chives or green chili pepper slices. 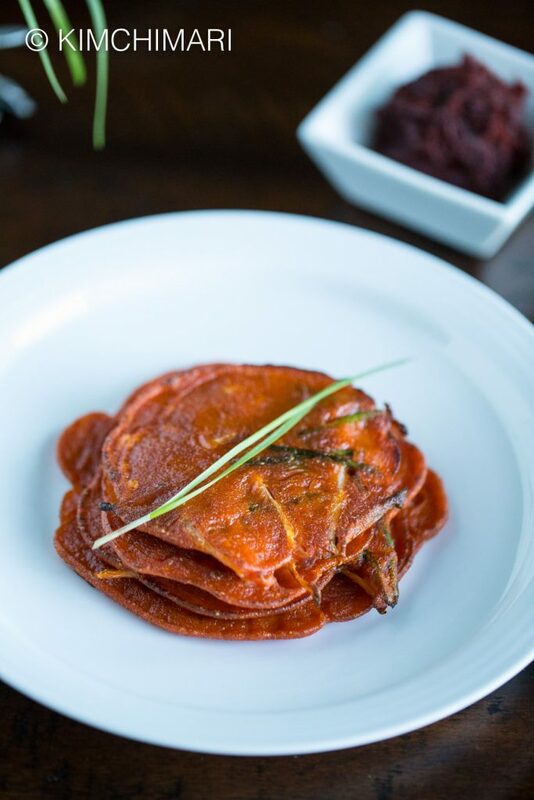 Gochujang Pancake with Chives is a very traditional Korean pancake that goes back over 300 hundred years. 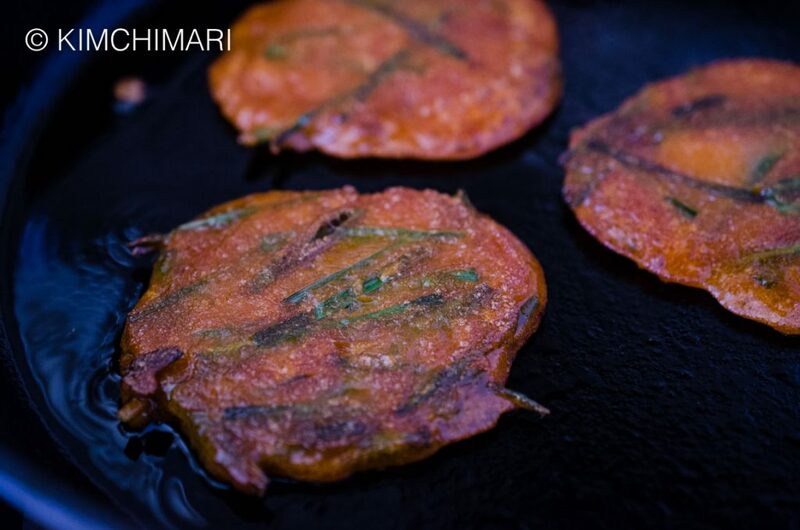 A great simple recipe that allows you to enjoy the deep flavors of gochujang. Ready in 15 minutes! Wash and rinse chives. Cut into roughly 2 inch (5 cm) lengths. *Because gochujang is strong in flavor, the stronger flavored Chinese chives or Korean chives will work better. 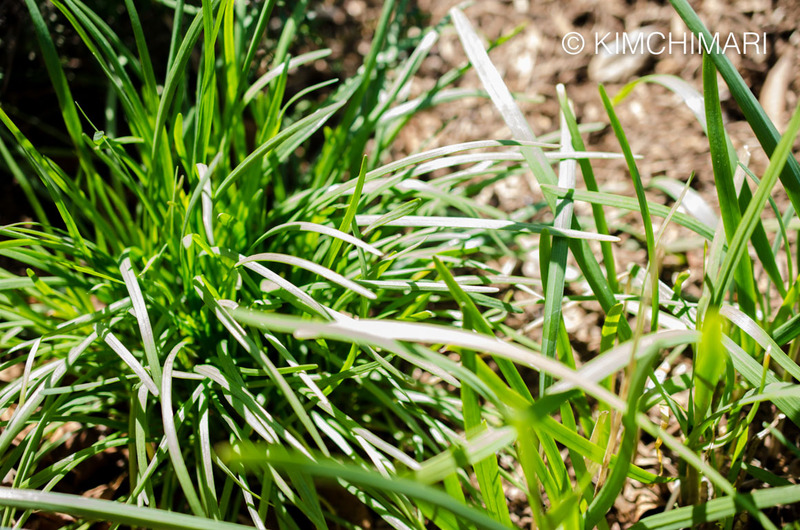 American chives may be too weak in flavor but you can try it! 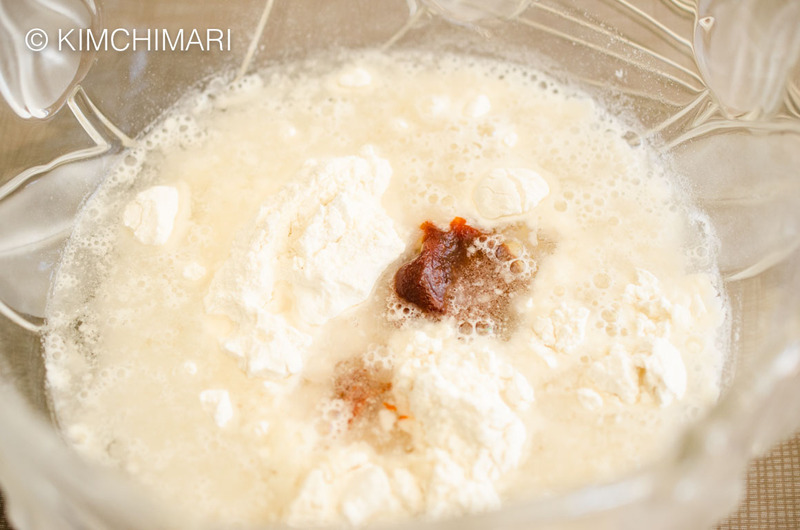 Make batter by mixing flour, water and gochujang. Use a whisk to make it easier. Mix until there are no lumps. Batter will be thicker than your usual Korean savory pancake (jeon) consistency. Heat good amount of oil (1~2 Tbs) in frying pan on medium high heat. Ladle the batter into the pan to make 3 inch pancakes. You can make one large one too but normally jangtteok is made in smaller sizes. Because the batter will be thick, make sure to spread it out a bit with a spoon or ladle so it doesn't come out too thick. Fry gochujang pancake for 2 mins or so until the edges are cooked. Turn it over and cook another couple minutes until they are slightly browned. Although this pancake is not at all a sweet pancake, if you use a store bought gochujang it will taste slightly sweeter than if you used your homemade gochujang. If you prefer it to have a slight sweeter taste then you may want to add a tsp of sugar to the batter. Try mixing 1/2 Doenjang with Gochujang for a more funky flavor. Try making it with other vegetables like green chili pepper, zucchini and Korean namul greens. Add crushed tofu or ground beef and pork for a more hearty version. Pairs wonderfully with Korean Makgeolli as anju. « Kimchi Fried Rice (Kimchi Bokkeumbap) – So easy and yummy! You mentioned that mixing the gochujang with the doenjang would give it a *funky* taste. What kind of taste is it, and does it dull the spiciness of the gochujang? I love this paste, but my husband and daughter can’t handle the spice. Yes, you are totally right – many gochujang contain corn syrup. That’s why I make my own 😉 – recipe is on my blog. But if you just want to buy it, I recommend Premium Gochujang with 100% Korean Ingredients by ChungJungOne (https://amzn.to/2K0KrrR). This one contains rice syrup which is the traditional ingredient. Hope this helps, good luck! HI, you can use any kind of all purpose flour. Thank you! Awesome!! Hope you like it. Enjoy! I”m watching a past season of Three Meals A Day and in the episode I watched last night, they made these pancakes! Hmmm, I thought at the time, I haven’t seen these before, and I re-watched the making of them several times. No chives in their version, but they added clams, which they had left over after clam salad and soup. And now you have posted them! It was fun to watch the residents gobbling them up as fast as they were made.